Synopsis: The popular Marathi TV channel Zee Yuva is back again with a new TV show called Prem He. 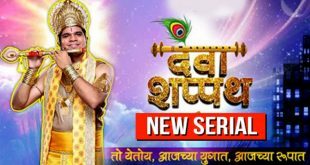 The show is produced by Santosh Kanekar under the banner of Bodhi Tree Multimedia, while it is directed by Santosh Manjrekar and Praveen Parab. The lead characters of the show is led by the stars like Spruha Joshi, Siddharth Chandekar, Vaibbhav Tatwawadi and Tejashree Pradhan, while Sunil Barve, Veena Jamkar, Prathamesh Parab, Krutika Deo, Ayli Ghiya, Vandana Gupte, Satish Pulekar, Lalit Prabhakar, Bhagyashree Mote, Chetan Chitnis and Sneha Chavan in the supporting roles. The story of the show comes from Sachin Tadakhe. Talking about its Screenplay & Dialogues, these are written by Sameer Penkar while the music is composed by Nilesh Mohrir. The TV show is all set to hit the small screen soon. Prem He is all about defining love and relationships showcasing several impossible love stories, encouraging the youngsters to follow their heart and feel the true love. At times, you need to lose your mind in order to follow your heart just because you cannot be sagacious and in love at the same time. While sometime it becomes important to break the rules. The show will therefore seen narrating elements like fun, crazy, intense and exhilarating love stories of a few young lovers, who will cross the boundaries, put everything at stake, and go to unimaginable levels to win their love in the most unconventional manner possible. The stories will be youth oriented love stories presented in a glossy, sunshine manner bringing hope, fulfillment of fantasy and an aspiration quality. Most of the times, the stories will look at authentic backdrops with a mix of rural & small town Maharashtra to lend a visual differentiator.